"I'm like anybody else. It's just my life that was a little bit different." Grasshopper Films has released the official US trailer for an acclaimed Brazilian indie film titled Araby, originally titled Arábia in Portuguese. The film played at numerous big film festivals last year, and is a James Joyce-inspired Brazilian road movie. The film follows Andre, a young boy living in an industrial neighborhood in Ouro Preto, Brazil, near an old aluminum factory. One day he finds a notebook from one of the factory workers, which sets him off on a journey unlike any he has been on before. The film stars Murilo Caliari, Aristides de Sousa, Gláucia Vandeveld, Renata Cabral, and Renan Rovida. This looks like a very contemplative, engaging film that might offer up some unique and important wisdom about life. I quite like the music they use in this trailer. Andre, a teenager, lives in an industrial town in Brazil near an old aluminum factory. One day, a factory worker, Cristiano, suffers an accident. Asked to go to Cristiano’s house to pick up clothes and documents, Andre stumbles on a notebook, and it’s here that Araby begins — or, rather, transforms. As Andre reads from the journal entries, we are plunged into Cristiano’s life, into stories of his wanderings, adventures, and loves. 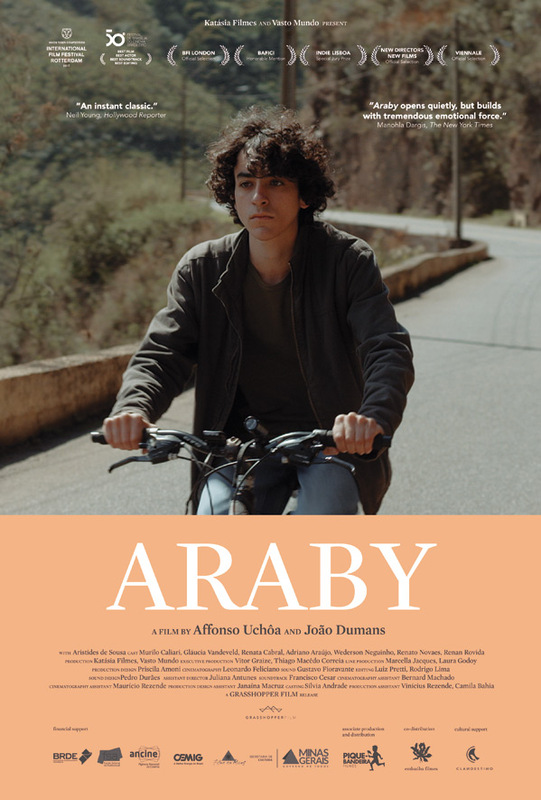 Beautifully written and filmed, Araby is a fable-like road movie about a young man who sets off on a ten-year journey in search of a better life. Araby is co-directed by Brazilian filmmakers João Dumans & Affonso Uchoa. The screenplay is also written by João Dumans & Affonso Uchoa. This premiered at the Rotterdam Film Festival last year, it also played at New Directors/New Films and other fests. Grasshopper Films will release Araby in select US theaters starting on June 22nd this month. Interested in seeing this?